FOX Dynamark Mini Bike Information and Chronological Guide. Overall Fox History and Info. There isn't much history on the Fox Corporation (Janesville WI), so details are a bit thin. But I'll try and fill in what I know, and hopefully add more info to this page in the future. 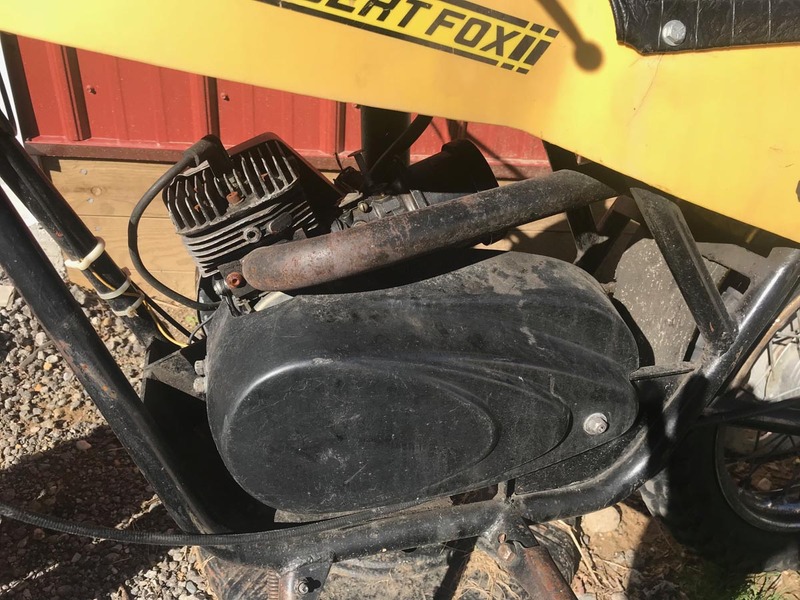 In 1966 Fox started to get more serious about minibikes and introduced their "Sport Bike" (2.5hp Lauson) and "300" models (3 or 4hp Briggs) mini bikes. The 300 model had 6v lights, full suspension, jackshaft, fancy fenders and gas tank covers, centrifugal clutch. This can be seen in their Fox catalog #6, along with their go karts. 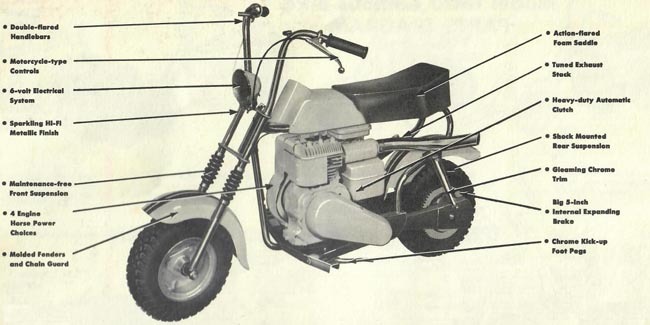 1967 Fox Campus Mini Bike from catalog #7. 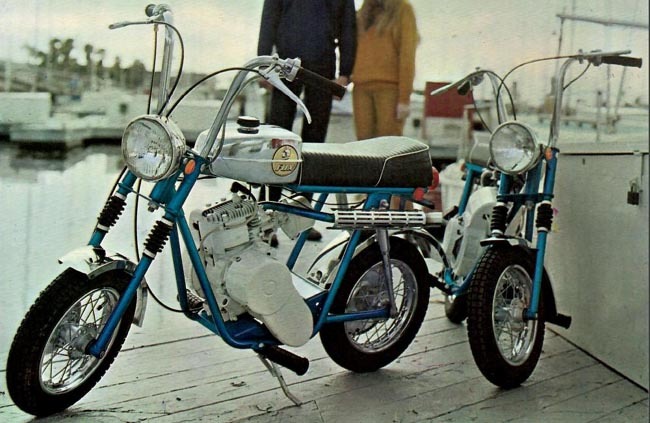 By 1967 Fox really got serious about mini bikes. Their Fox catalog #7 showed their "Campus Bike", which was basically an upgraded model 300 from the prior year. It was available in a variety of formats from a no motor version, to a 5hp Briggs model with lights. The Campus mini bike had 6" solid wheels and full suspension (front and rear), and the top model had a funky gas tank plastic cover, giving it a sleeky 1960s look. Fox also sold lower minibike models like the Sprite, the Trail Bug, and the Doodle Bug (no relation to the China-made Doodle Bug DB30 of the 2000s). The Sprite had 4" wheels, and the Doodle Bug used 6" wheels. Most mini bike models used a jackshaft. Note that in 1968 and 1969, as seen in the Fox catalog #8 and Fox catalog#9 (looking for a full Fox catalog 1969, or a good scan of it), the models didn't change. 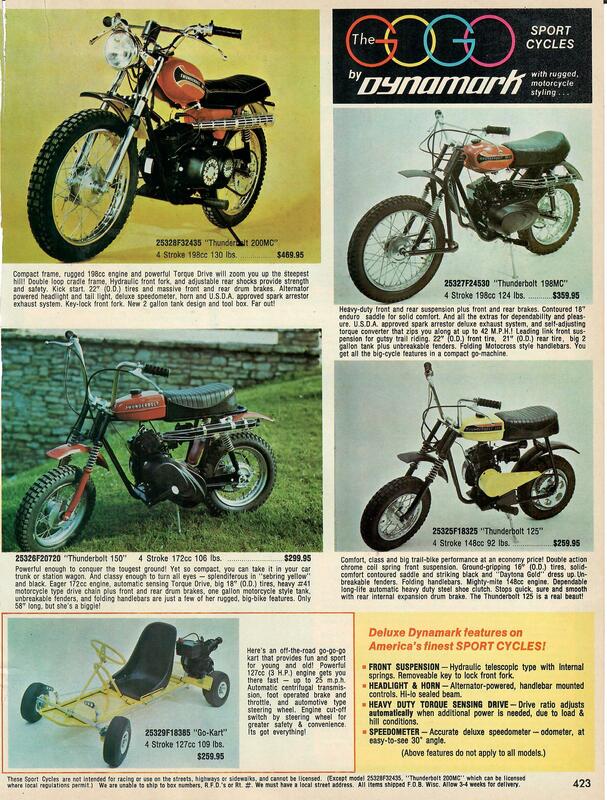 1970 Fox Street Scamp mini bikes from catalog #10. 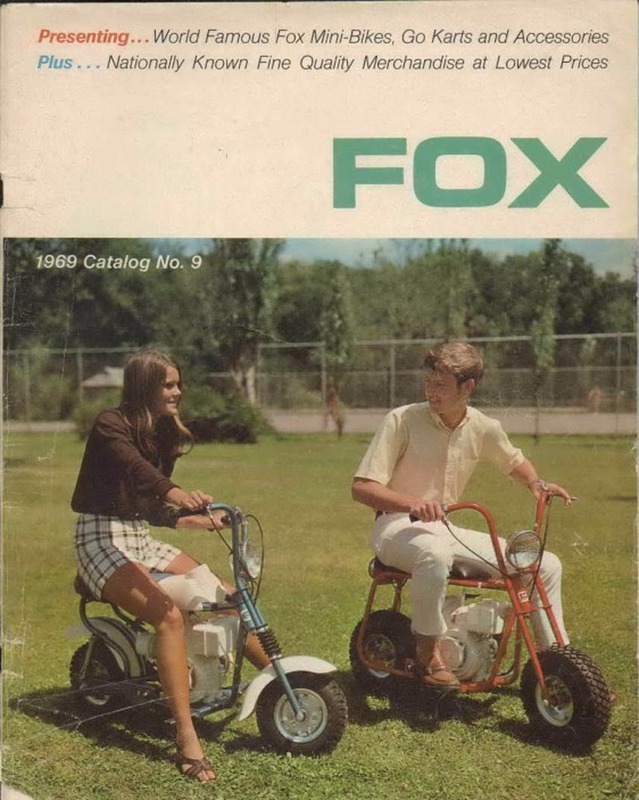 With 1970 Fox completely changed their mini bike models, as seen in their Fox catalog #10. This probably came about because Rupp changed their models significantly, and Fox wanted to compete. The big change was spoked 10" wheels on all models (except for the Doodle Bug, which still used 6" solid wheels.) These 10" spoked wheels were not available from any U.S. manufacturer, so they were imported from Italy (originally used for Italian scooters), which was what Rupp was doing too. 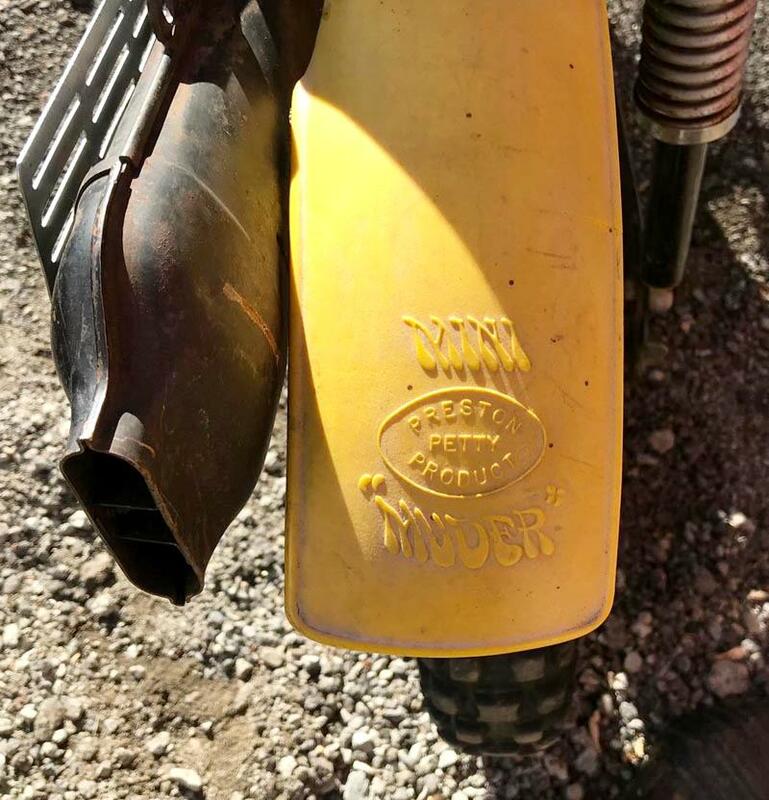 Also all minibike models had chrome gas tanks and fancy exhausts (except the Doodle bug's was painted, but it used the new gas tank design too). Also new to Fox was Kelsey-Hayes rear disc brake used on the rear sprocket for all mini bike models (even the Doodle bug minibike). Some Fox mini bikes had disc front brakes too. A first for Fox (and something many others followed) was the 20 degree slant motor mounts and a jackshaft (but no jackshaft on the Doodle bug, but it too had the slant motor mount). 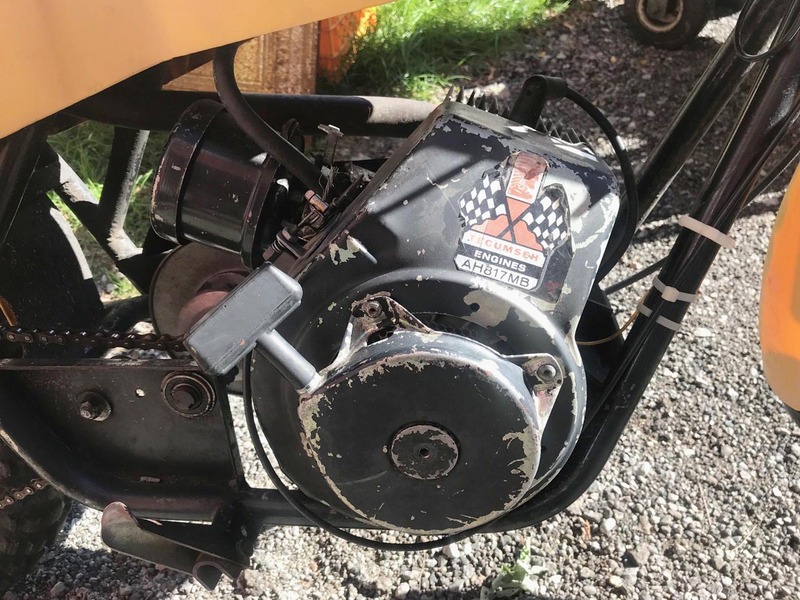 This 20 degree motor mount was known as the "tilt power plant" and was a first on the Fox 1969 models. Tecumseh was the motor of choice too, as Briggs was trying to get away from mini bikes. To get around the float bowl issue on the carb/slant motor issue, they used a diaphram carb. 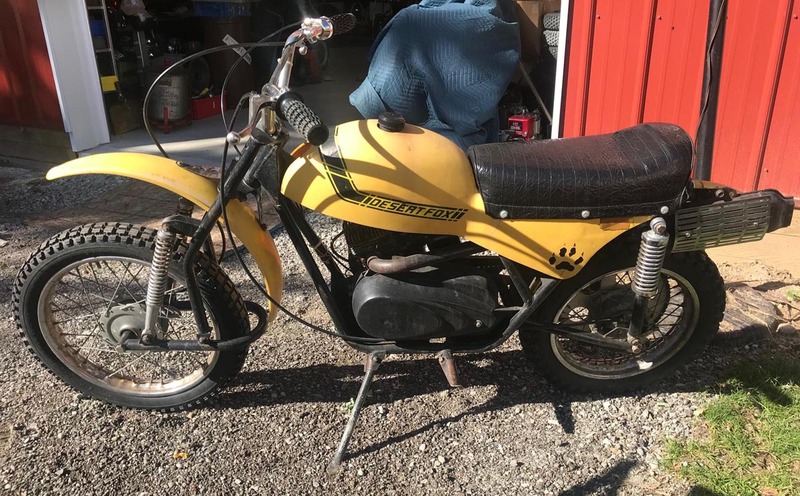 Single speed bikes used centrifugal clutches and dual speed minibikes used a 2-speed automatic clutch system, which utilized two centrifugal clutches (one on the motor and the other on the jackshaft.) This set up used a centrifugal clutch with two chains going to the jackshaft. Fall 1972 Fox/Dynamark catalog showing the Thunderbolt models. 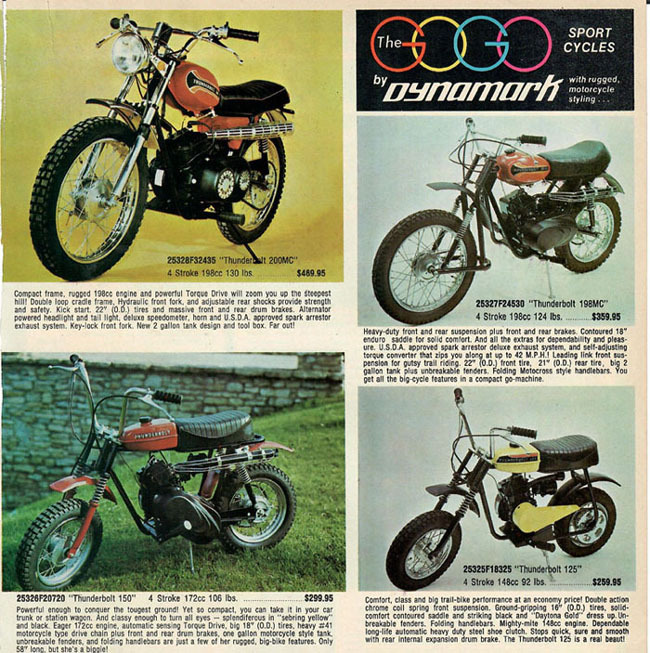 In 1972 Fox (now also marketed as Dynamark) released many new models including the Thunderbolt line of mini cycles. All the Thunderbolt models are using Tecumseh 3.5, 4, or 5hp motors. 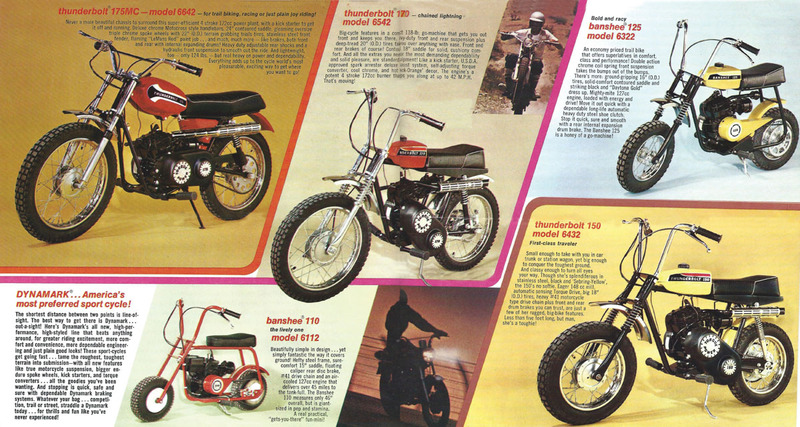 Here's the 1972 Dynamark/Fox catalog #12 which shows many of the new Thunderbolt models. Fall 1973 Fox ad from a NY department store catalog. Snowsports Dealer News - April 1974, Mansfield, Ohio. Snowsports Dealer news has learned that Speedway Products, Inc. has been sold for an undisclosed amount of cash to Fox Corporation, Janesville, Wisconsin, according to Bill Graff, a Fox spokesman. The company acquired "the entire Speedway line and most of the company's assets". John Morrow, former Speedway president, has also moved to the Fox Corporation and has been named Vice President of operations. front "earls" leading link suspension, 14" wheels, drum brakes, Comet torque converter. on this bike (a commonly damaged part.) The tank decals are not original to this MC198 model. 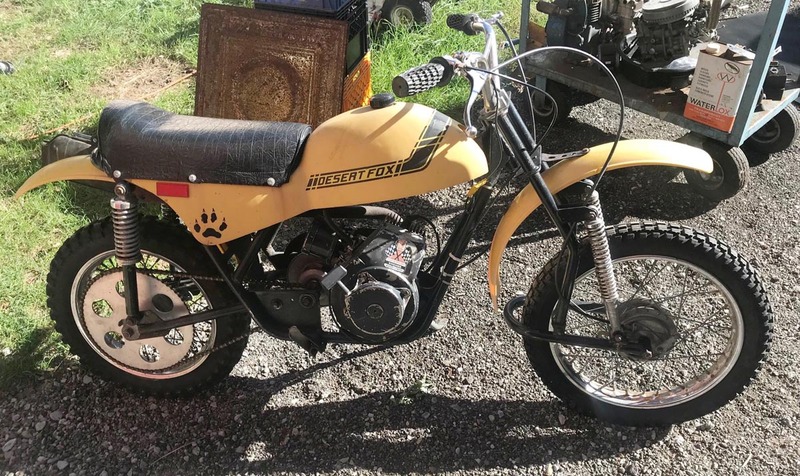 The 1974 or 1975 Desert Fox mini bike model. Another minicycle more than a minibike. and rear plastic fenders. Unfortunately this bike is not mine.